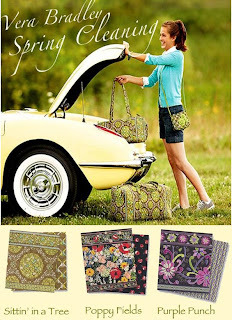 A Chance to Win a Vera Bradley Travel Wallet! Chance to win a new Travel Wallet ($42.00 value)! 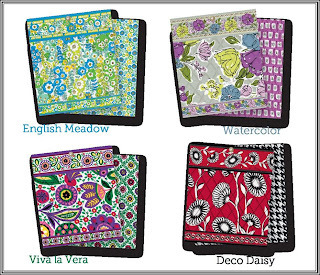 Post your favorite new Vera pattern on our Face book wall! Take a look! 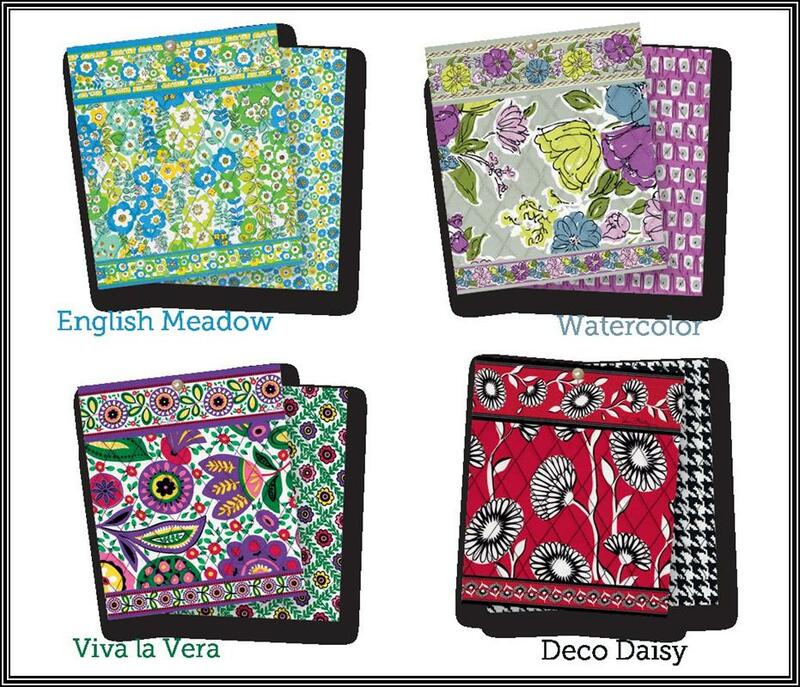 Post your favorite new Vera Bradley fabric choice any where on our Facebook wall by Wednesday, April 3rd and be eligible to win a Vera Bradley Travel Wallet in your favorite color. Which is your favorite - on the top beginning on the left, English Meadows, Watercolor and on the bottom Viva la Vera and Deco Daisy? Not a Facebook friend? Click below and join Facebook. It is great way to keep up with friends and family. 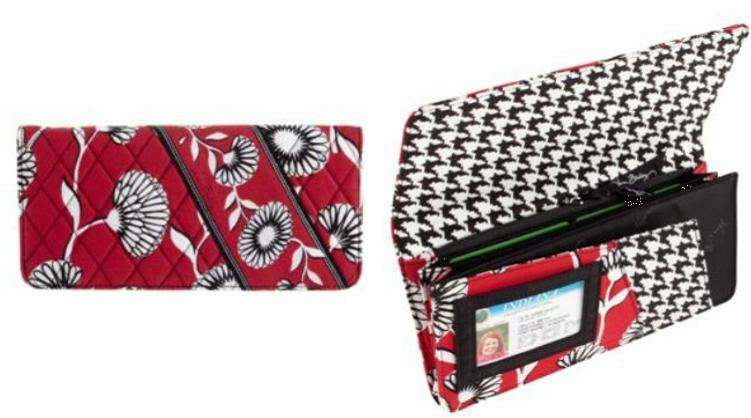 This great new Vera Bradley style, the Travel Wallet, is perfect to hold a ton of information you may need while on vacation, but it is also a wonderful flat (not fat) wallet for the person who enjoys a large wallet, but does not want a ton of weight in her purse. 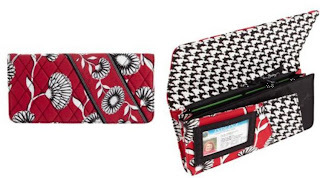 50% OFF Retiring Vera Bradley Colors & Styles! Retiring Vera Bradley 50% Off Starting TODAY (March 29th)! As a FB friend or blog subscriber, you are the first to know! Retiring Vera Bradley goes 50% off today at both shops! 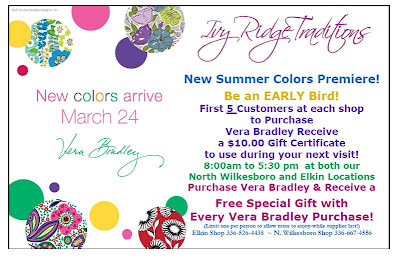 Please recommend to friends and family to "Like" Ivy Ridge on Facebook or subscribe to our blog by entering their email in the box just under our Blog Buddies coupon at www.ivyridgetraditions.blogspot.com for more insight into sales, shop events and new arrivals. I am trying to make more things homemade and eat less processed foods. I really never find a bottled salad dressing that I love, so I am always experimenting with dressing recipes. I found this one on allrecipes.com as their number one rated salad dressing and we really enjoyed it over the weekend. Think of it as almost a cross between French salad dressing and a your favorite vinaigrette dressing. It is tangy, but sweet. Blend the red wine vinegar, honey, mustard, lime juice, pepper, salt, paprika, garlic, onion, oregano, and sugar together in a blender until thoroughly mixed. Drizzle the olive oil into the mixture while blending on low. Chill at least 1 hour before serving. Thanks to sunnybird who posted our photograph above on the recipe's allrecipes.com location. These new cute Key Keepers that have a ton of detail on them. 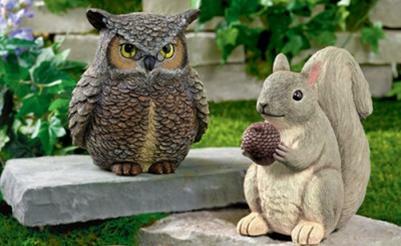 We currently have the squirrel, owl and a raccoon in stock at both locations. 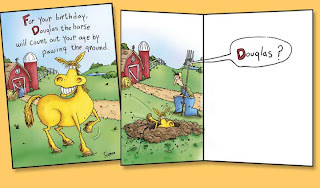 Oatmeal Studios Greeting Cards are Back in N. Wilkesboro! 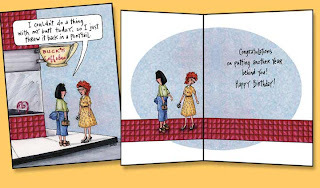 Warning: Reading Oatmeal Studios card can lead to peeing in your pants! Please stop by the restroom first! 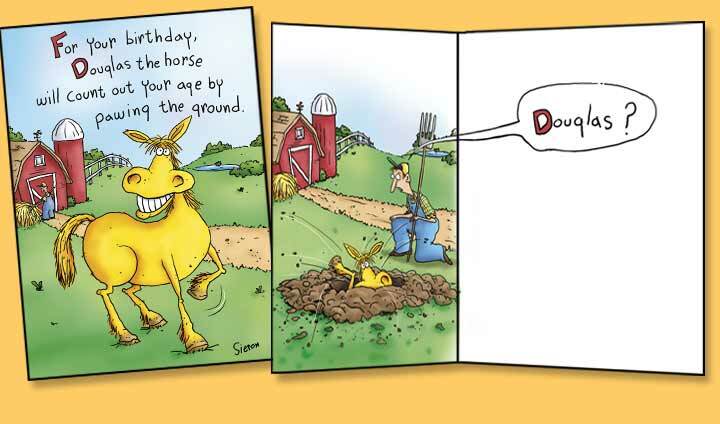 Note: These humorous cards can be purchased at both our N. Wilkesboro and Elkin shops. We now have a brand new spinner that has just arrived in N. Wilkesboro. New Healthy Recipe ~ Meatball Sandwiches! I found this recipe in Taste of Home's Guilt Free Cooking recipe book. This has become a favorite for Mackenzie and I. The most difficult part of the whole recipe is to only eat one serving rather than 2 or 3. In a large bowl, combine the first nine ingredients. Crumble grounded turkey or beef over mixture and mix well. Shape into 40 meatballs, 1 in. each. In a large skillet coated with cooking spray, brown meatballs in batches; drain. Place meatballs in a large saucepan. Add the pasta sauce; bring to a boil. Reduce heat; cover and simmer for 10-15 minutes or until meat is no longer pink. Spoon meatballs and sauce onto bun halves; sprinkle with mozzarella and Parmesan if desired. Yield: 8 servings. I have provided a link below to the recipe online, so you can search for other great healthy Taste of Home recipe. If you find one you like, please share it. 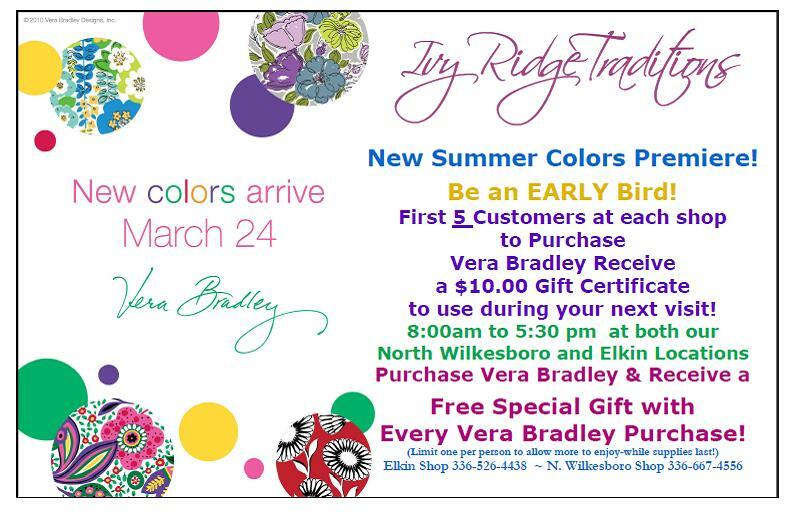 Join Us for Our Vera Bradley Premiere! Angela Update: Living Life & Expecting Joy! Okay, where to begin? Lots of areas in my life have been on hold for a while; which as many who know me realize that I do not deal well with such things when I am in a "stand-still" moment. These are the times in which I look around and try to find that something that will shake things up a little. With this in mind, so begins the month of December. If you are my friend on Facebook, then you may already know I was offered and accepted a job as an Intensive In-Home Treatment Specialist with a local mental health center beginning December 6, 2010. I have worked with the Department of Social Services and New River Behavioral Heather Care before beginning Ivy Ridge and always adored working with children and their families. I know you are thinking that I must have been completely crazy for committing to such an undertaking during the busiest month of the year for retail. However, I truly believed that this was a God-sent opportunity that I should not pass up. I was definitely at a place in my life where I felt I was not going forward, one of those "stand-still" moments I mentioned earlier. So I began a second career, one which seemed to work perfectly to allow me to manage Ivy Ridge in the mornings, much like when I worked for Girl Scouts. The new position would permit me to work with children and their families in the afternoon after school. It seemed like the perfect fit. Basically, I was a member of a team of three people, in which one member was a clinical therapist, who provided families with a time-limited intensive family preservation/counseling program to help children remain in their home when they were at risk of an out-of-home placement such as foster care, juvenile detention and psychiatric hospitalization. I know that definition sounds like a huge undertaking, but I loved every minute of working with the families we served. I cannot say enough good things about my other IIH team members! I actually thought that the ability to work both at the shops and with Intensive In-Home Services was too good to be true. After having multiple conversations with the local mental health center management about my personal responsibilities and with many reassurances that the position was a perfect fit for my lifestyle, I jumped in feet first. Well, as many of you know, sometimes things do not always remain the same. After several months, lots of office requirements changed and the ability to be flexible was no longer an option. I was truly disappointment, however I knew it was not a position in which I could continue. So very reluctantly, I resigned at the beginning of March. Many friends and wonderful customers have been asking where I have been and my first reply is how grateful I am to be back. You can now find me at the shops. I am actually working at the North Wilkesboro shop three days a week and often by myself in the shop. You will also see me working one day a week in the Elkin shop, again by myself and floating around on the remaining days. I have always loved helping customers, simply wrapping gifts and working on merchandising and now I feel grounded in the main reasons I begin Ivy Ridge almost eleven years ago. Yes, I am still doing some paperwork and other management stuff; however I am grateful to still have my mom, Carolyn, to work with me. The financial and paperwork part of Ivy Ridge has always been her strength and I would not have an Ivy Ridge without her. I am still left with a feeling that I have another purpose, in which to use my social work background. I believe my short time with the IIH program was God-sent, because I realized that I still had the ability to make a connection with children and their families. The connection was a real one, just not a "job", but a calling. With this in mind, I have decided to explore the option of becoming a therapeutic foster parent. My daughter, Mackenzie, and I had a long discussion and agreed that we have a lot to offer another child. 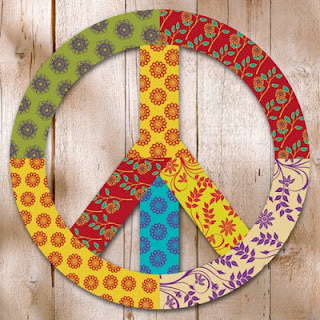 So, we begin MAPP training to license as a therapeutic foster home on Monday, March 21st, with Barium Springs/Rainbow Center. We are going to start slowly by offering monthly respite care for therapeutic children; in which a child with special needs stays with your family over the weekend to allow their own therapeutic foster family to attend to other responsibilities. Please keep us in your prayers as we begin this new journey. Life is not always perfect. I know I am so blessed to have such a wonderful support system of friends and family, to work for myself in a business I love and live in a wonderful community. With a new realization of how wonderful life can be, I am enjoying every minute of the day. I know every minute is not guaranteed to be amazing, but the peaceful feeling of knowing you are where you belong is priceless. 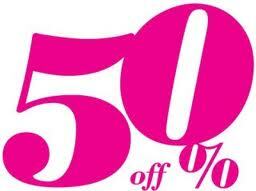 30% OFF at Both Locations!